This is a continuation of our Wood Scrap Sculpture post. We had so much fun making our sculptures so we decided to just paint flat wood scraps and practice mixing colors on each wooden shape. Each individual scrap turned out beautiful, but when you put them all together they made some amazing Wood Scrap Collages. First gather some wood scraps. I've gotten wood scraps from craft stores, home stores, and the Wood Shop Teacher at the High School that I work at too. Then we just started painting and mixing colors on the flat pieces of wood. This was a lot of fun and many of these could even stand on their own as beautiful miniature paintings. Then we started arranging them in different ways to create collages. This was a great activity....painting the scraps, arranging them, and just simply playing/building with them. You can glue them in the end or just leave them as is to arrange and rearrange. 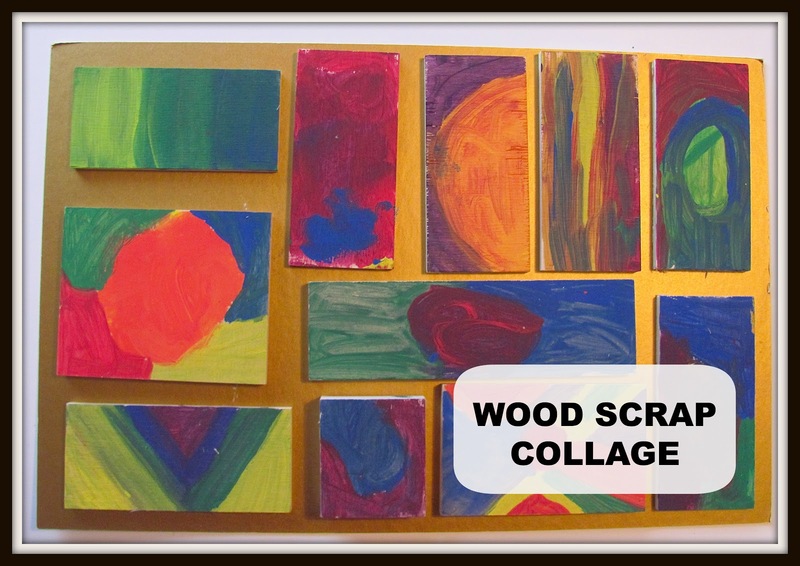 Hope we have inspired you to create some colorful scrap wood paintings or collages. How colorful and so much fun!!!! Thanks ....love the color too. Thanks Aleacia. We used tempera believe it or not. They are so fun! You are right - these look amazing! What a fun project.